Sleeping Beauty is just a month away! 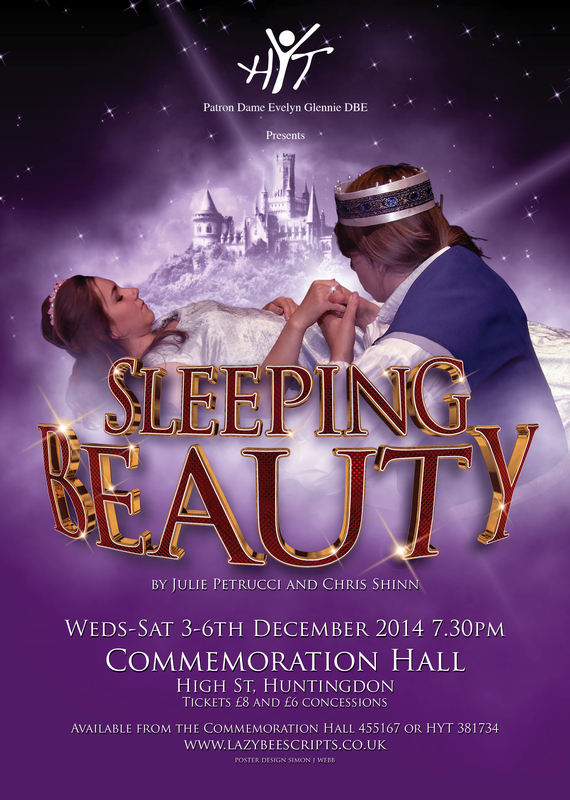 Well we’re just weeks away from this years winter production which is the pantomime Sleeping Beauty! Directed by Nicole Matthews and Kieron Wallis we’re looking forward to putting on a magical show which will be fun for all the family. This year we are also delighted to welcome Roy Bellas as our Musical Director and his three piece band to bring the music of the show to life. Tickets will be available direct through HYT in the near future and should be direct from the Commemoration Hall shortly. 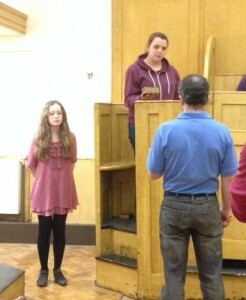 We hope lots of people come along and support our young cast (and rookie directors!) 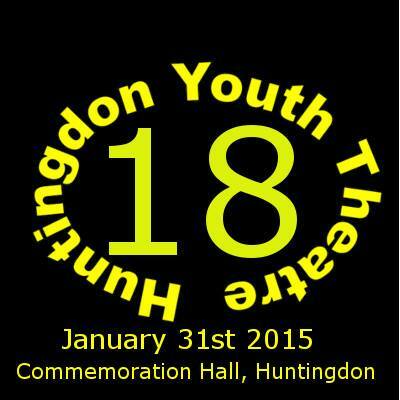 on our last production before next January’s 18 year celebration! 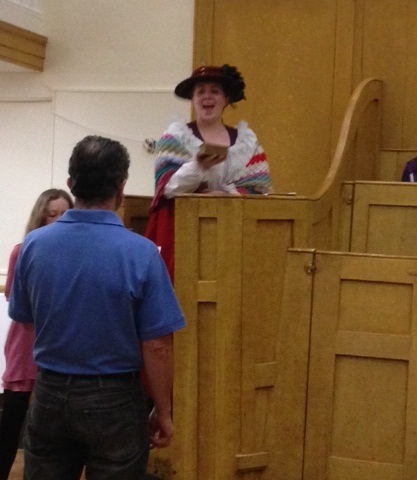 Tonight saw the last performance of the run from our production of The Trial of Joshua Slade. A big thank you to everyone who came along to support us during this very busy and sold out few days! 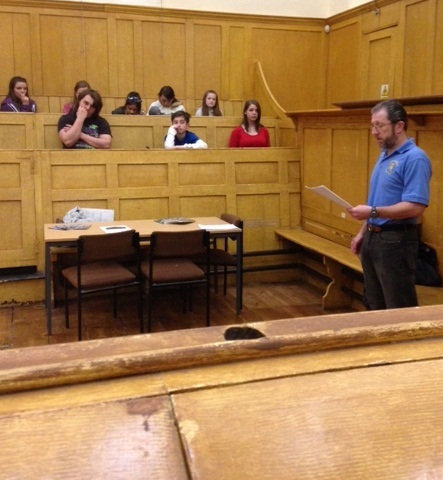 Our cast and crew really enjoyed working on this production and discussions with the audience members showed us how divisive, even today, the evidence put forward and the case was. 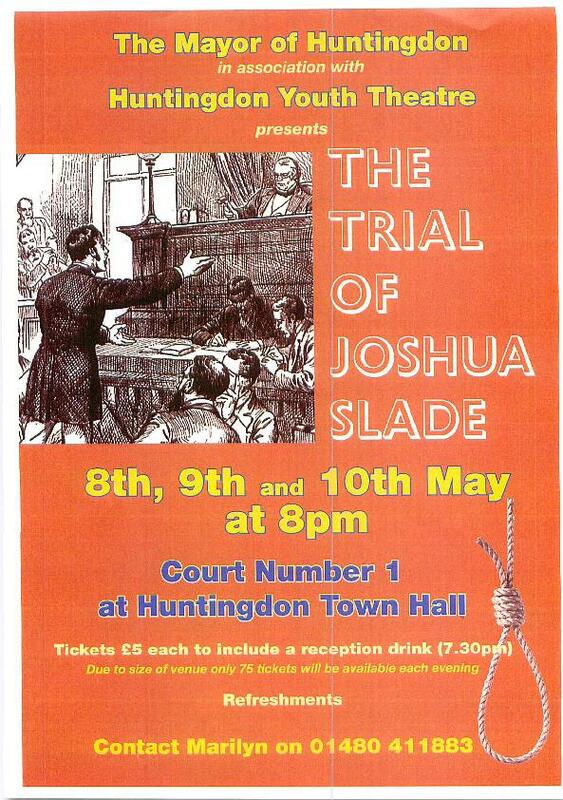 Over on our productions tab we’ve updated our page for this show which contains some historical information from the case, including two contemporary accounts of his confession and the details of the murder. 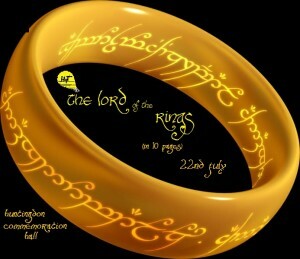 To see this information, as well as details of the production under the productions tab. We’ll be updating this and other productions with time at this link. So we’re entering production week and very busy with work on The Trial of Joshua Slade. 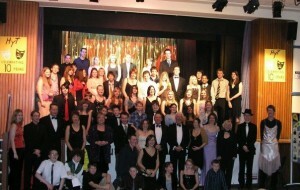 The production is a sell-out and we thank everyone for supporting us on this project. It has been an interesting and exciting one for us to be a part of under the guidance of director Beryl-Anne Whitehead. We hope that those of you who are able to make it this week are able to enjoy the experience in this unique setting. For those of you who missed out we’re hoping to bring the production to you as a radio play. Watch this space! Alongside this we’re slowly updating the rest of the site and have started the task of adding more information about our past productions. We hope to feature photos and memories of every production in our past so invite our members, past and present and those who remember seeing the productions to contact us here and over on our Facebook page to offer their own memories of productions! 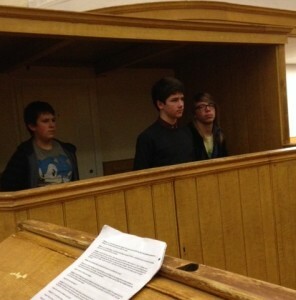 First rehearsal in the courts! 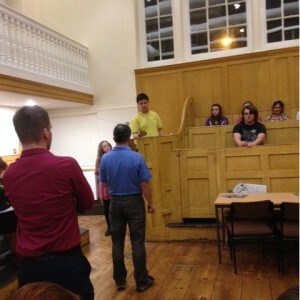 Last night we had our first rehearsal in the court rooms for “The Trial of Joshua Slade”, special thanks to Kate who was the court artist for the evening and taking a few snaps of the events as they unfolded! The clerk of the court reads out their verdict. Tickets are available NOW, so if you want to see this production with a strictly low capacity due to room available in the court rooms contact Marilyn at 01480 411883. We are currently working on a very special collaboration with the Mayor of Huntingdon’s charities to perform this piece. 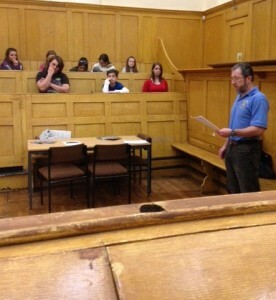 “The Trial of Joshua Slade” is a recreation of an actual court case with a script from local historian Richard Meredith and uses the actual records taken by the clerk on the day to put forward the evidence available and let the modern day audience make up their own minds. In 1827, this case captured the imagination of the public, leading to large crowds congregating around Huntingdon court and crowding the streets, bringing the town to a halt. The murder of Reverend Josiah Waterhouse on the 3rd of July gained national attention and media coverage and the trial was monitored closely by central government and presided over by Mr Baron Garrow (the man who was the focus of the BBC series “Garrow’s Law” and first coined the phrase “innocent until proven guilty”) and The Lord Chief Baron Alexander. 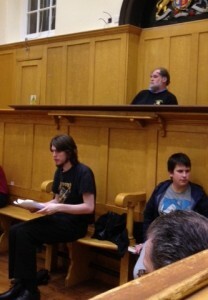 In May of 2014 we are going to be performing this in the very court room the case was heard in nearly 200 years ago. For tickets contact Marilyn from the Huntingdon Town Council on 01480 411883, they’re £5 each (including complimentary drink) and in limited number, we are excited about this production and hope you will be too!